The NSPCC’s Underwear Rule and Share Aware teaching resources are to be circulated to over 10,000 teachers after being awarded the Personal Social and Health Education (PSHE) Quality Assurance Mark. The PSHE Association gave the two guides, which will help primary school teachers across England explain to children how to stay safe from sexual abuse and how to be share aware online, the seal of approval as they are launched across the country. PSHE Association Subject Specialist Karen Summers said: "The Share Aware activities and materials are child-friendly and engaging and enable teachers to address different aspects of online personal safety, including the dangers of taking and sharing personal images. The Underwear Rule age-appropriate materials enable teachers to address issues such as the difference between appropriate and inappropriate touch, what parts of the body are private as well as how to seek help from people they can trust." The NSPCC’s Share Aware guide for teachers of KS2 students will provide support to professionals looking to strike up conversations with children about who they are talking to and what they share when they socialise online. The guide includes straightforward advice that will help teachers to feel confident talking to children about online safety. Each pack of resources contains lesson plans, class activities, teaching guidance, a Powerpoint presentation, communication for parents and a further reading list. Peter Watt, Director of National Services at the NSPCC added: "It’s vital that we ensure all children learn how to recognise right from wrong behaviour. 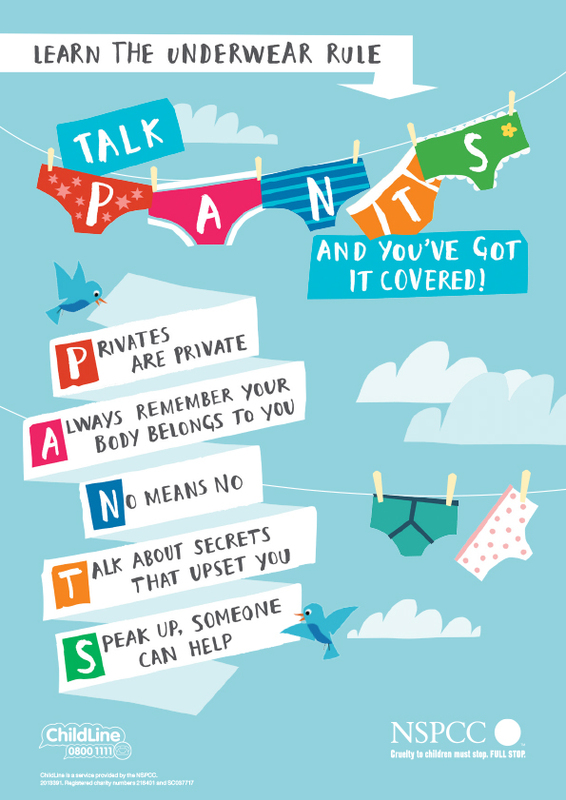 Our successful Underwear Rule guide is already helping to catch perpetrators and is proving to be an important contribution in the fight to prevent sexual abuse and our Share Aware guides are key to ensuring children understand who they are speaking to and what they are sharing online. "Towards the end of primary school students’ online activity begins to change as they start to join social networks so it’s important to address issues such as sexting and sharing personal information as early as possible. We are thrilled that the PSHE Association has given our new teaching resources this high profile endorsement - both of these guides are a great way for helping teachers to feel more confident in talking to children about these important issues." To download the new Underwear Rule and Share Aware teaching resources visit: www.nspcc.org.uk/underwear-schools and www.nspcc.org.uk/shareaware-schools.